In October 1946, seven million more women than men lived in occupied Germany. In this study of unwed, divorced, widowed, and married women at work and at home across three political regimes, Elizabeth Heineman traces the transitions from early National Socialism through the war and on to the consolidation of democracy in the West and communism in the East. 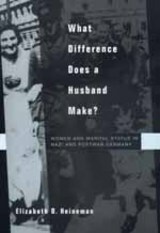 Based on thorough and extensive research in German national and regional archives as well as the archives of the U.S. occupying forces, this pathbreaking book argues that marital status can define women's position and experience as surely as race, gender, sexual orientation, and class. Heineman finds that, while the war made the experience of single women a dramatic one, state activity was equally important. As a result, West German women continued to be defined in large part by their marital status. In contrast, by the time of reunification marital status had become far less significant in the lives of East German women. In one broad, comprehensive sweep, Elizabeth Heineman compares prewar and postwar, East and West, lived experience and public policy. Her sharp analytical insights will enrich our understanding of the history of women in modern Germany and the role of marital status in twentieth-century life worldwide. Elizabeth D. Heineman is Associate Professor of History at the University of Iowa.